I designed these to fit within 8x8 tiles comfortably, so we could even use them to spruce up the game selection screen of future volumes of A53. …and I've got logos for all of the competition years ready to go; if we have access to the raw judging data to determine them, we can retroactively declare these achievements. Last edited by M_Tee on Sun Jul 22, 2018 2:07 am, edited 1 time in total. These look great as well as idea is neat. 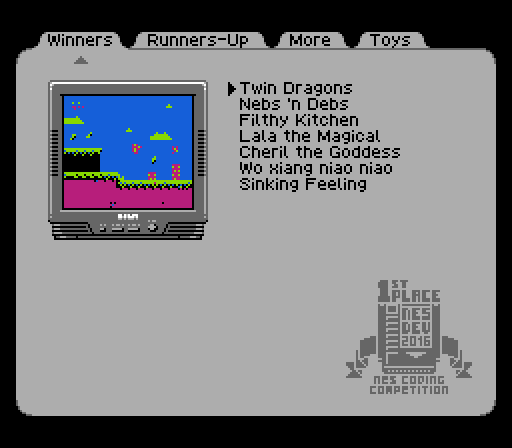 My first concern when I looked at the mockup was if there is enough free space for it in PPU, but after a quick look into PPU Viewer in FCEU as well the fact that awards are 1 bit graphics, it should not be a problem. All in all, if there isn't much trouble adding it, Im in for the idea. What a great initiative, M-tee! I think they look great, plus i’ve thought we should have a way to visualize the results for the non forum using cartridge buyers. 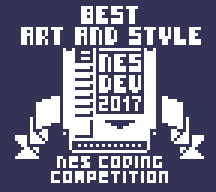 Maybe a badge for non competing entries would be neat, too? Could work but would have to be placed in the lower-left corner, as the entire right side is used for rendering text to. if there's anything new at all, it would have to use sprites, and I think most of the sprites are being used for the color overlay of the TV. I think implementation would be fine. I just looked at volume 3 in Mesen, and I think one of the background palettes is completely unused. 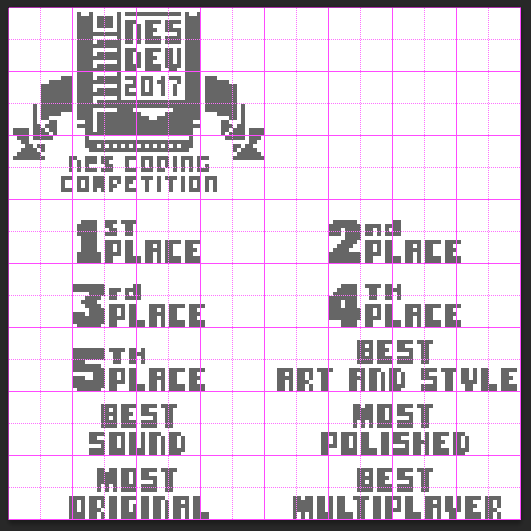 The right side of the screen is already set up to be a big 1-bit bitmap by displaying the same tiles twice with two different palettes, so you could just put the award logo into the bits that text would have gone in for that area of the screen, and color it with a copy of the palette it would have used but dark gray. I agree. How about just the lower portion without a title at the top for all other entries? Regarding inclusion on A53, that's just a suggestion. If not possible, these badges could be used for other purposes, such as box art for expanded releases, etc. at the developer's discretion. Is there any interest in awarding "Best Multiplayer" awards retroactively? 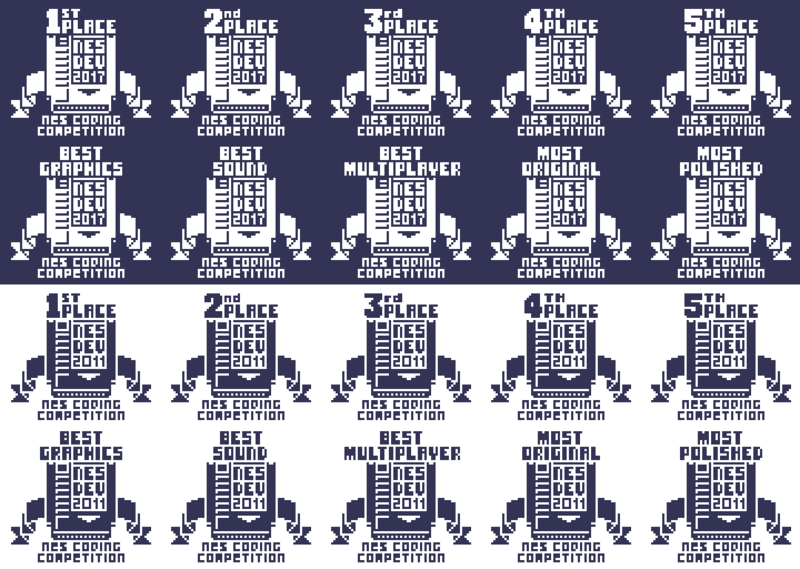 Obviously, we wouldn't base the awards on previous ranking / score alone, as scores for games that include multiplayer could have been weighted by other factors. I think the easiest way to do so would be to take all of the games that include a multiplayer feature include them in a ranking-based poll that's something along the lines of "Rank these games based on the quality of their multiplayer experience only." Send the poll out to all of the judges of past competitions and whoever's in the exclusive other-judges group, and have a hard deadline. Whoever votes in that time gets their vote counted. Whoever doesn't doesn't. No pressure to vote for those who don't have the ability to easily play these multiplayer. Then, take the game that ranked highest from each year and award the category (maybe even send out a late monetary prize for these as well). It'd be a nice way to maintain consistency in award presence with future years, and to bring some attention back to some of the older competition titles. I think it's a fun idea. So, what games are we talking about, specifically? Alfonzo Melee and Nothing Good Can Come of This? Wrecking Balls is a up-to-4 players versus game. The original bomber titles could have up to 3 players, so the goal was to make full use of the 4-score adapter. Everything, except the titular balls, is nametable based animation. Also, we elected to remove it from cart inclusion as it didn't feel complete enough. No music driver and at least one gameplay bug. A ranking poll with a question for each year would be a better way to organize than I'd previously suggested.